It's the entrepreneur's dream. Come up with a great idea for a product, build it, and they will come. 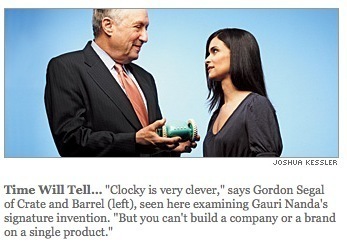 But for Gauri Nanda, it's true. Inc Magazine reports that 2008 revenues were projected to be over $2 million. 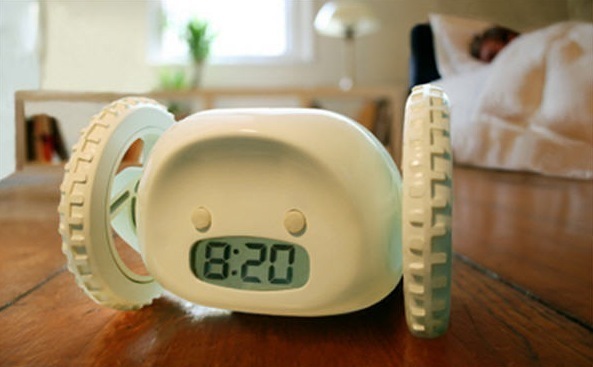 It's an alarm clock that rolls off the table and demands that you find it somewhere in your room when it goes off in the morning. Designed for a class project at MIT's Media Lab, the project was an overnight hit once she sourced online through alibaba.com. The commercial success of the product was largely launched off of coverage by engadget, gizmodo and boingboing. Pretty amazing what this new attention economy means for entrepreneurs. A compelling story suddenly can build value massively, just for the sheer fact that people surf their RSS readers constantly while at work. Now that's inspiring. Her next challenge is to figure out how to turn this great success story into an enduring business for Nanda Home, her design firm. I can't wait to hear what's next. 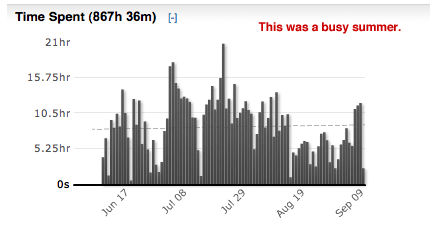 Ivan Kirigin (founder of Tipjoy) recently posted his rescuetime graph. 1,600 hours logged -- now that is a lot of work being done. I can attest as well -- the Y Combinator 3 month session is a time of incredible productivity. Also, I can't believe I spent 21 hours straight in front of a computer at some point this summer. That's like mad crazy "in the zone" coding. Oh, to be in the zone more often... I hope to be back there soon. Someone posted a link to a full video of unreleased movie August on Hacker News. It's worth watching the 2nd scene in the movie in the meeting room with Hartnett and potential business partners. Probably the most unintentionally funny scene in the whole film. Here's a gem from that scene: "That's so 3rd quarter 99. You want bleeding edge cross platform robust scalable architectures? Well duh. That's what everyone wants." 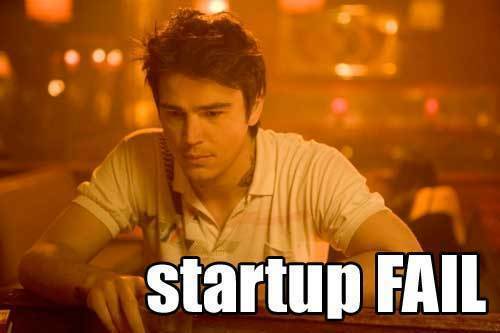 Other than that, it's a boring tailspin of a movie about the implosion of an egomaniacal startup founder with a reality distortion field the size of Kansas. It's shot beautifully, though. And I do love the Radiohead in the soundtrack. I also couldn't believe Hartnett dropped a reference to [edit: Luis Bunuel and] Salvadore Dali's surrealist film Un Chien Andalu! James and I saw it at the Dali retrospective at the Tate Modern last summer. Also: I don't understand how filmmakers think that putting a tense driving score to very EXCEEDINGLY boring scenes (e.g. Hartnett cooking dinner, doing dishes, etc.) will suddenly transform the scene into dramatic brilliance.